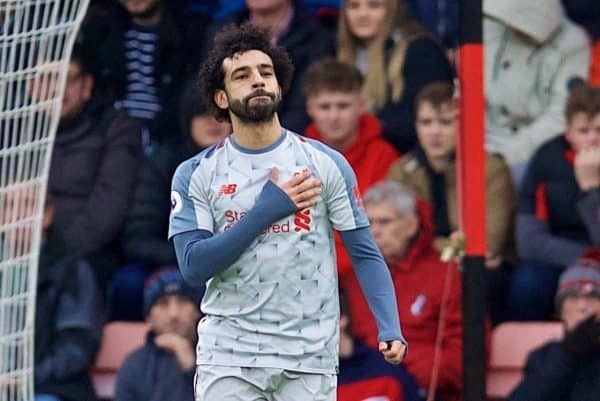 Liverpool produced one of their best team displays of the season as Mohamed Salah returned to top form to fire his side to a 4-0 victory at Bournemouth. Alisson headed into the weekend with the joint-best clean sheet record in Europe’s top five leagues, having made an immediate, distinct impact on the Reds’ defensive efforts since his arrival from Roma. It wasn’t his quietest afternoon in a Liverpool shirt, but Alisson was very comfortable throughout—even when he was required to produce a header even Virgil van Dijk would be proud of after a defensive mixup in the first half. It was fitting that, on his 500th appearance in the Premier League, Milner played away from his favoured midfield role, with the veteran returning to full-back duties to allow Trent Alexander-Arnold rest ahead of Tuesday. He understandably took time to get going, and a poor clearance led to Alisson‘s aforementioned header, but he grew into the game as the wheels began to turn. Certainly unspectacular, but he’s a serviceable option at right-back, which allows Fabinho to remain in midfield. With Gomez and Dejan Lovren both out, Matip made his second consecutive start on Saturday—and only his fifth of the season, having dropped down the ranks. It was a big test for the No. 32, and though he and Van Dijk benefited from injury to Callum Wilson, he was impressive regardless, sticking tight and getting crucial challenges in as well as using the ball well in possession. Matip is clearly very comfortable on the ball, and like Gomez allows Liverpool to circumvent the opposition midfield—though he employs a different approach, with mazy dribbles instead of direct, vertical passes. Continued fitness issues for the rest of his centre-backs have left Klopp relishing the endurance of Van Dijk, telling reporters that his “thumb is always up” when it comes to availability. On his 30th start for Liverpool in the Premier League, he helped keep his 17th clean sheet, and was dominant once again, talking everyone through the game and winning everything on the ground and in the air. 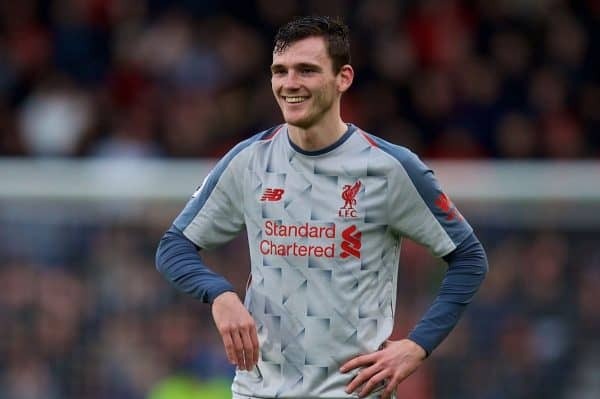 Having missed the 3-1 win at Burnley due to a minor injury, Robertson was restored to the starting lineup at the expense of Alberto Moreno, who had a mixed night at Turf Moor. He struggled with the trickery of David Brooks in the first half, but improved dramatically after the break, marrying solid defensive play with his typical industry up the left, and it was his cross that led to Steve Cook’s own goal. Injuries to Lovren, Gomez and Nathaniel Clyne have heightened Fabinho‘s immediate importance to Klopp’s rotational approach, but the versatile Brazilian was retained in his natural role. With the Reds playing almost at full throttle, Fabinho was a much-needed safety net, and a constant presence at the base of the midfield, making a series of vital interventions to keep the pressure on a struggling Bournemouth. This is certainly Fabinho‘s best position, and he is increasingly proving he’s the best candidate for the No. 6. Having been left out at Burnley, Wijnaldum returned to the starting lineup in Klopp’s trusted double pivot alongside Fabinho, but looked a little loose, lethargic and slow to the ball early on. He was a regular outlet in possession, however, and certainly didn’t drift through the game as he often can on the road. 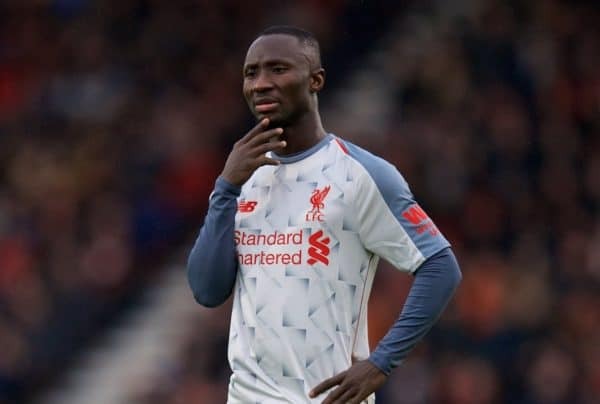 In his first time making back-to-back starts since August, Keita also started alongside fellow summer arrival Fabinho for the first time, but his role came on the left of a 4-2-3-1. Two nutmegs in one early dribble in the first half set the tone, but he could have been utilised more; looked bright whenever he was on the ball, and vitally pushed Liverpool forward in possession. Substituted with 25 minutes to play, likely with a start against Napoli on Tuesday night in mind. 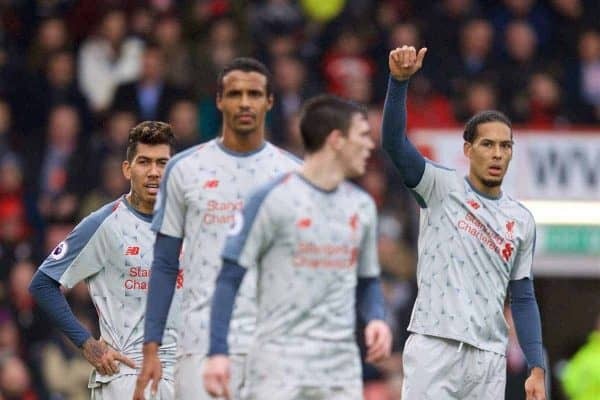 Fears of an ongoing malaise for Firmino this season were allayed with a goal off the substitutes’ bench at Burnley, and the Brazilian then turned on the creative flair on Saturday. He operated much higher than in his last away start in the Premier League at Watford, instead performing a similar role to last season only with Salah ahead of him. Firmino was more involved in Liverpool’s bright, one-touch play in attack, and had the impetus to try a shot from range for the opener, before laying on Salah’s second by winning the ball and laying on an intelligent flick. Starting in his fifth consecutive game in the league, Shaqiri gave Liverpool another edge with his raking, long passes, and was more involved than Keita in the first half in the search for pockets of space. He was less prominent after the break, and as with Keita was brought off on 65 minutes with a crucial Champions League decider to come. Again employed as a No. 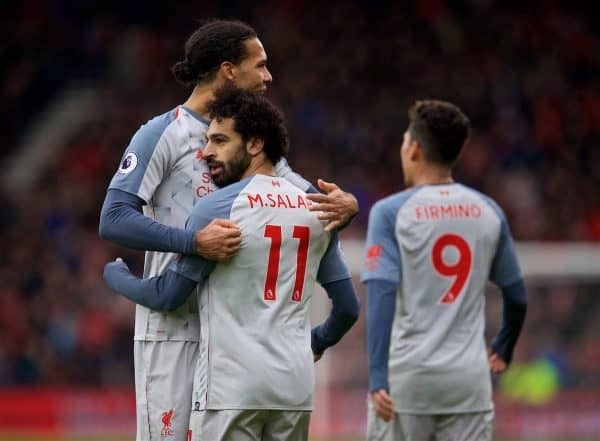 9 in the 4-2-3-1, Salah enjoyed a competitive game up against the impressive Nathan Ake, with his persistent runs behind the defence eventually rewarded in the first half with a tap-in from an offside position. His second was vintage Salah, racing onto a loose ball between the centre-backs, riding a challenge from Cook, bamboozling Ake and beating Asmir Begovic with a fine, placed finish at the far corner. And his hat-trick goal showed the confidence of last season, brushing off Cook again before turning Begovic twice and clipping home to cap a title-quality performance. Truly stellar from Salah; back to his best. Adam Lallana (on for Keita, 65′) – 7 – Took an all-action approach and supplied the pass for Salah’s hat-trick goal. Sadio Mane (on for Shaqiri, 65′) – 7 – Kept things moving and continued to pin Bournemouth back. Jordan Henderson (on for Firmino, 81′) – 7 – Let off the leash as Fabinho stayed in the No. 6, and looked to thrive with the freedom further up the pitch. Klopp had a big call to make with his team selection, and opting to shift Milner to right-back and keep Fabinho in midfield proved to be the right decision. 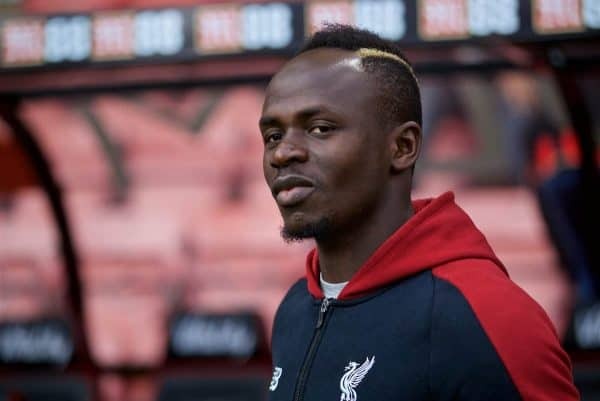 He was rewarded with one of Liverpool’s best performances of the season, and a reminder that this side can pair solidity with attacking brilliance—and much of this is due to a tweaking of Firmino and Salah’s roles. The manager also utilised his substitutes well, withdrawing three key players ahead of Tuesday night to allow some much-needed rest.